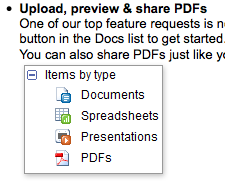 This has probably been one of the most requested features for Google Docs: the ability to upload PDFs. This is really the only feature that has been missing for my Great Google Docs Conversion of 2008. The addition of this new feature means that I can clear out even more documents that are currently wasting away on my hard drive. What about you? If you haven't converted to Google Docs, will this new feature encourage you to make the switch? Can Google Apps Replace Lotus Notes?